This elegant dessert of sponge cake and prunes soaked with rum syrup and layered with crème anglaise is a Colombian favorite. 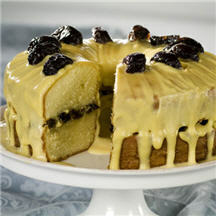 Save time by using a store-bought cake and preparing the prunes and crème anglaise the day before serving. For Crème Anglaise: Place milk, sugar, yolks, flour, salt and vanilla extract in blender container; cover. Blend until smooth. Pour into medium, heavy-duty saucepan; cook over medium-low heat for 15 to 20 minutes, stirring constantly, or until custard is thick enough to leave a line when you drag your finger across the middle of the spoon. Do not boil. Remove from heat; cover with plastic wrap and place in the refrigerator, until cool, about 1 1/2 hours. Makes 2 cups sauce. To Assemble: Remove the prunes from the syrup. Slice 6 prunes in half lengthwise; set aside for garnish. Chop the remaining prunes; set aside. Cut the cake in half horizontally into 2 even layers; place the bottom cake layer into a dessert platter that has at least 1-inch-high sides. Soak the cake with half of the rum syrup using a brush. (It should be saturated but not be soggy). Spoon 1 cup Crème Anglaise over the soaked cake half. Top with chopped prunes. Cover with second cake layer. Brush with remaining syrup without making it soggy. (You may have left over syrup depending on denseness of cake.) Spoon rest of Crème Anglaise over cake; decorate with sliced prunes. Cover; refrigerate for at least 2 hours before serving.